Making A Lifetime of difference! 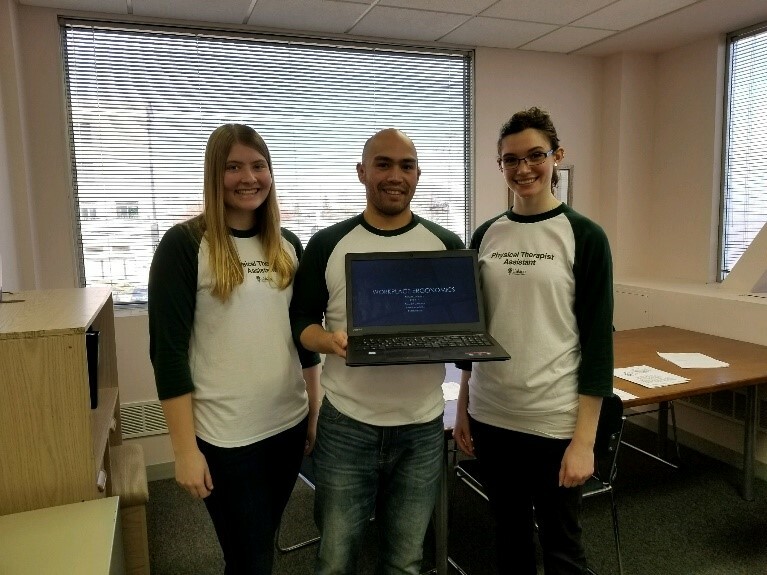 Community Outreach: a way to Apply the Standards of Ethical Conduct The Physical Therapist Assistant Students of Oakton Community College were encouraged to embrace the Standards of Ethical Conduct of the Physical Therapist Assistant and put them into action. The students identified opportunities within the college and the greater Chicagoland area to apply these fundamental elements of our profession. Professor Melissa Mendoza, PT DPT NCS provided oversight and guidance through the semester long identification of needs and provision of service to the community. The service was based upon the, role of the PTA as an essential team member to encourage health and wellness and enhance their patient/ client's quality of life. These are a few of the projects that were created by the Oakton PTA students and a sampling of the insight gained by making the Standards of Ethical Conduct of the Physical Therapist assistant come to life before graduation! As we know, service learning and helping others in the community is a large portion of our profession. To get us geared up for first exposure, we were assigned a service learning project. 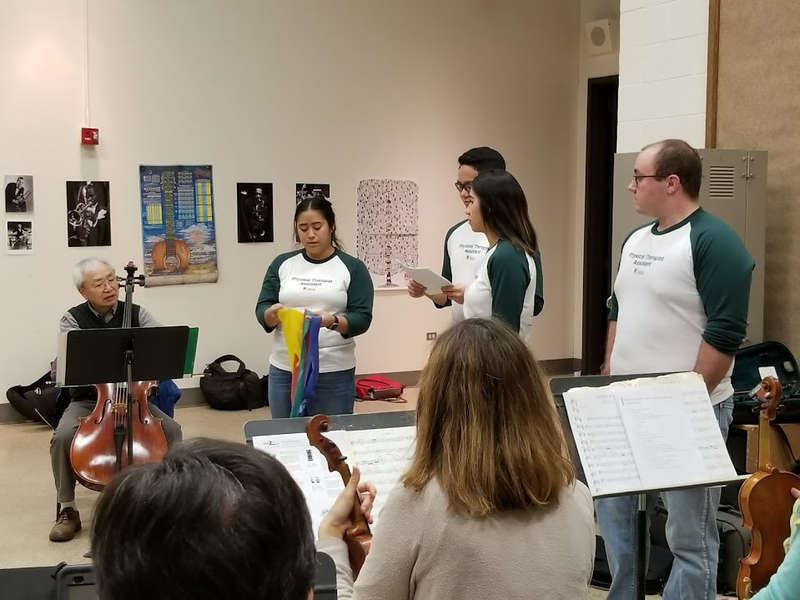 A few of us second year PTA students, decided that we were going to help the musicians from the Oakton Community College Orchestra, our college’s orchestra, that had reached out to our professor a couple months before the service learning project was announced. The musicians had complaints of pain while practicing and afterwards as well as general discomfort. With everyone having some background in playing musical instruments growing up, it sparked our interest and we decided that supporting the arts would be just the thing. With the help of our professor, we were able to get in contact with the director and set up our first meeting. Our goal for this project was to inform the musicians about exercises, stretches, warm ups, body mechanics and overall wellness to help prevent any further injuries and pain without affecting their sound. As a group, we wanted to help the musicians minimize their pain so that they could continue to participate in their activity. After doing research, we were able to put together some exercise and stretches that would help benefit the musicians such as exercises that helped correct posture, relieve tight muscles that have been misused due to poor posture and general fitness exercise to improve their overall conditioning and well-being. 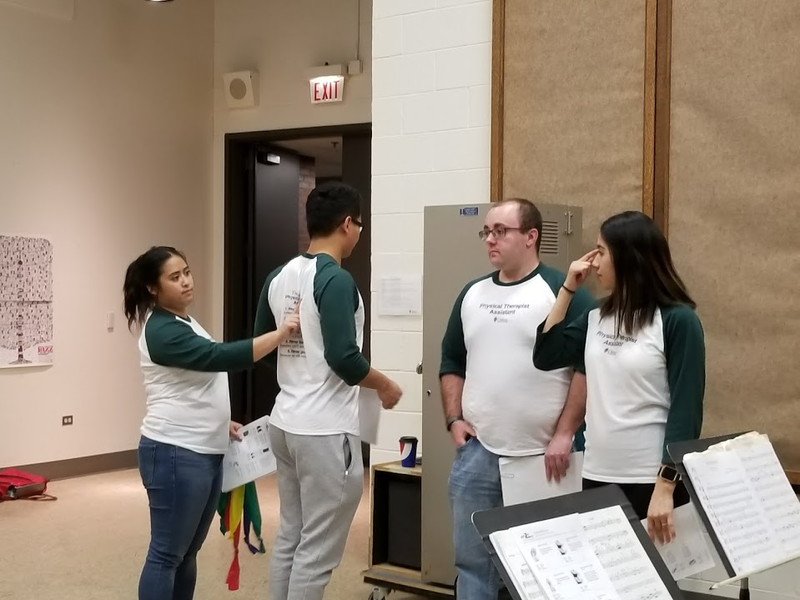 As a group, we gave the orchestra a presentation on this information and taught them how to correct their sitting posture while playing their instruments as well as how holding their instrument differently could benefit them. They were supplied with a home exercise program and instructed how to perform the exercises to fix impairments brought on from practicing music. Working with the musicians taught us the importance on going out to educate people about what the profession of physical therapy is about. Most of the musicians were not aware of the benefits that physical therapy could bring to their normal everyday lives and to their playing abilities. While the interventions provided to the musicians were insightful to them and us, we believed that we could make a greater impact by advocating for them to get new chairs. Most of what we observed during our presentation was that their chairs were one of the main causes for their impairments. With our recommendation and help from our professor we were able to communicate with the college and have them provide chairs that would better the musician sitting posture. We were very pleased and even surprised when we heard that word had gotten around to other departments about the insights we had shared with orchestra. We were even more surprised when those departments reached out to us to come share those insights with them. We are very privileged to be able to help, advocate, and learn from this profession. While we are not yet licensed we are very aware of the opportunities that we encounter as well as the impact that our care and responsibilities will provide in the future. For our service learning project, we went out into the public to inform those at risk on proper workplace ergonomics. As part of our duties as PTAs, we must find those at risk and try to prevent further injury to their bodies. We decided to find a local company, CSED, who has multiple locations with office employees that would benefit from our knowledge. We presented our project based of the standard of ethical conduct for PTA. Prior to the presentation, we researched common musculoskeletal disorders that affect those in office settings. We also looked at workplace ergonomics, proper posture and preventative measures. Afterwards, we made an HEP to benefit those individuals at risk. These exercises included strengthening underused and the stretching of overused muscles. These were then performed at the presentation, so these individuals could pass their new knowledge to the other departments not present. Pamphlets were also distributed for proper posture and workstation placement. Extra handouts were provided and left on the company bulletin board for those who were unable to attend the presentation. As part of the duties as PTAs is to follow the standards of ethical conduct. One of the standards that was applied during this service learning project was standard 2A. This states that PTA’s need to act in the best interest of the client. After presenting our material to the employees of CSED my peers and I were asked to help reorganize some of the workstations, so they could ensure that they were working in the most ergonomically efficient area. Standard #8 states that as PTAs, we should participate in efforts to meet the health needs of people globally. Starting with these women, we brought preventative techniques to decrease the risk of injury. We were demonstrating proper posture, maintaining curves of the spine, and changing the environment to fit the individual. This way, they can teach others who may also need risk prevention to improve not only their workday efficiency, but also activities outside of work. Creating healthy habits will benefit an individual in all aspects of life. Having the opportunity to educate a group of people on the benefits of physical therapy and exercise is one of the most rewarding goals during our service learning. We were able to help those in attendance understand how certain exercises and stretches should feel and was able to answer questions they had on form and technique. We felt that being in an open environment made it easier for questions to be asked that otherwise might go unanswered. This opportunity has enhanced our knowledge and exposed us to teaching preventative techniques to the public through volunteer work. Project “Massage” had taken place at Oakton Community College on February 5th from 10am until 2pm. At this event, therapeutic and relaxing massages were conducted by volunteers from Oakton’s Physical Therapy Assistant (PTA) program lead by the 2nd year students. Using techniques and knowledge learned in the program, the project was delivered for the students, faculty, and guests of Oakton Community College to raise money for the PTA program, to promote the physical therapy profession, and of course to encourage wellness. By finding a meaningful and interesting volunteering work for you, volunteering can bring relaxing and energizing escape from your day-to-day routine of work, school, or family commitments. Not only do you feel a sense of fulfillment from volunteering but as well as to the people that you spend your time with. Regardless of your age or situation, you can have a positive influence in someone else’s life simply just by volunteering. Just like the second-year PTA students, the simple act of massaging other people brings a sense of joy at the same time contentment for them by knowing that education pays off and by relieving some of the patient’s pain. Also, these students gave half of the proceeds to the charity of their choice while half goes to the club as a means to lessen the cost of their licensing books. Volunteering allows you to connect to others – of different walks of life or even different point-of-views. It’s a way to make new friends and contacts. By sharing or committing to an activity together as well as by exposing you to people with common interests, volunteering can strengthen the bond of relationship. Also, by connecting to people, you increase your social and relationship skills. It’s a great way to practice or develop your social skills by having a common ground of interest and by meeting the same people regularly. Through the massage, the PTA students had the chance to interact to other students with different courses and of different professions. Some of the students were actually curious to what a Physical Therapist Assistant actually does, some wanted to get the insights of being a student in the program, while few had no idea what a PTA is. Because of those questions, PTA students, of course, had to answer the questions which promotes not only the physical therapy club but also the profession. By connecting to other people, you can’t help but talk about things that you are passionate about. In the case of the PTA students, they are passionate about their health and the wellness of the public. The same reason why they got in the field! And thanks to the massage project, wellness was promoted. Patients were given instructions as well as information regarding their “knots” or a muscle spasm in medical term, ways to decrease the pain, and even talking about sleeping positions to decrease the chances of having tension in their muscles regularly. Volunteering can be one of the ways you can spread awareness especially about things you are passionate about. If you haven't already done so, get involved volunteering – join an established organization or create a team of your own. Multidisciplinary health care students in a simulated clinical lab setting. From orientation through the two years of the physical therapy assistant program at Oakton Community College, the Guide of Conduct for PTA has been a continual source reference, whether in the health care team structure, the foundations of the PT and PTA relationship, and most importantly, patient/client care. Now if there could be a [method in which it would be able to tie in some of those listed values into tangible experiences that would indeed be an invaluable learning tool. Fortunately, at the Margaret Burke Lee Science and Health Careers Center (more affectionately called, the Lee Center), students pursuing a career in the sciences, and more specifically the health care industry, are able to utilize the Simulation Hospital Lab. Although the Sim Lab is geared towards the nursing curriculum, in recent semesters, the PTA students have had the opportunity to experience a clinical setting on campus. Through the partnership between the nursing and the PTA departments, the Sim Lab allows for interdisciplinary teamwork and discussion through mock patient/client and health care provider interactions in differing clinical settings. During these mock clinical experiences, the students touch upon multiple Guide values to patient care: “Sound decisions”, “Integrity of relationships”, and “Altruism” to name a few. Through preparation, participation and discussions, nursing students, PTA students and faculty work together to successfully undertake a patient/client health care visit. Recently, it was a great opportunity for the PTA students to collaborate with another health care program in a simulated environment (the Sim Lab is not currently available through the PTA program). Students from both programs observed and discovered the scope of practice in one another’s health care profession, and allowed insight into more clinical, realistic post-graduate work situations and relationships. During the scenarios, students encountered situations which needed collaboration with the other professionals to deliver the best patient care, providing firsthand experience of the core values of APTA/PTA patient management. “Standard 2A. Altruism: Physical therapist assistants shall act in the best interests of patients/clients over the interests of the physical therapist assistant.” – By learning to operate as a cohesive team and understanding the roles of other professionals in patient/client care, the students were able to deliver the best service possible. Participating in the Sim Lab allowed for an open-mindedness, to look outside one’s own career goals, and see the importance of the collaboration in order to ultimately benefit the patient. The Sim Lab creates an opportunity to develop communication skills between health careers, and can establish an educational foundation of patient care for a life-long career of service. The experience gained by focusing on healthcare team development is an invaluable asset to help the patient receiving optimum service. “Standard 3A. Sound Decisions: Physical therapist assistants shall make decisions based upon their level of competence and consistent with patient/client values.” – Students participating in the Sim Lab were provided with case students/background information on the patients that were going to be treated, as well as individual goals and expectations from each of the healthcare disciplines. For a successful simulation, it was apparent that careful preparation for the “home health visits” was a key factor. This meant that if there was a lack of knowledge or uncertainty for the method of effective therapy, then as therapists, it was crucial to increase our competency, through research, practice, and seeking counsel (from other “therapists” i.e. faculty). A situation such as this can be relatable to real-world situations, in which a therapist may not be familiar with their patient’s diagnosis or impairment. It becomes the therapist’s responsibility to seek out the comprehension and knowledge outside of what would be considered “work hours” to effectively treat patients. This correlates to “Altruism” which refers to practices in the best interest of the patient over self (therapist). “Standard 4. Integrity in Relationships: Physical therapist assistants shall demonstrate integrity in their relationships with patients/clients, families, colleagues, students, other health care providers, employers, payers, and the public.” – The simulation specifically focused on helping students acknowledge and identify their roles as a PTA delivering interventions as part of a healthcare team. They gained a better understanding of what needs to be communicated, what is expected, and how they can help others utilize their skills as a PTA. By requiring a collaborative effort among healthcare professionals, the lab defines a clear role for therapists and explores how classroom learning translates into effective patient care. The Sim Lab developed integrity by creating an environment of accountability to job duty. When practicing in a “real-world” situation, the roles identified via this lab help the PTA determine how they can best represent the physical therapy practice and treatment of patients/clients. Another beneficial aspect to the Sim Lab was the round table type discussions after each “patient/client visit”. With the advantages of technology such as video and audio playback, the students and supervising faculty were able to have an open discussion about the successes and opportunities of improvement from each of the patient visits pertaining to the student health care teams. Even though it was important to a certain degree to “correctly” treat the patient, and to spot “sabotages” within the simulation, these discussion revealed that it was more important that the students had a heightened awareness of the level of patient and caregiver attention and care, as well as patient safety and patient/caregiver education. This concept of patient/caregiver care goes back to the Standards of Ethical Conduct for PTAs, (standard 8) “PTAs shall participate in efforts to meet the health needs of people, locally, nationally, or globally.” The discussion were not particularly focused on mistakes or missed opportunities, but about what made the collaboration successful in terms of better patient care (safety and education). The Sim Lab is a great opportunity for different health care programs at Oakton to have the rare chance to work together in a simulated health care environment, in which they actually have a patient verbalizing during therapy, as well as the possibility to interact with family members and/or caregivers. It would be great to try to push the departments to have more opportunities such as these on a more regular basis (weekend labs). The shared building space of the Lee Center allow for the ease of convergence and participation for the differing health care students at Oakton, and pushes the core idea of communication between health care professionals for optimal patient/client health care services. This past weekend we were volunteers at the Hustle up the Hancock. This event is run by the Respiratory Health Association (RHA). Every year more than 4,000 people climb to the top of the John Hancock building. The runners raise funds for the RHA’s lung disease and clean air education, research, and policy change efforts. More than half the participants have or know someone that has been affected by a lung disease, such as asthma, COPD or lung cancer. Upon our 5am arrival at the Hancock, our team was asked to simply assist with setting up medals, snacks, water and posters. With some leisure time left before racers arrived at the top floor (the observatory room), we had the opportunity to view most of the informational posters distributed throughout the floor. One of the posters included facts and statistics about tobacco use, specifically tobacco use prior to the age of 21. We werekindly approached by a representative who introduced us to the Tobacco 21 movement by the Preventing Tobacco Addiction Foundation who guided us through the information. Additional posters were placed on the observatory floor with educational facts along with information about how to get involved through petitions, volunteering and donations. We participated by handing out medals at the finish line to the runner, congratulating and thanking them for their participation and also cheered the racers at the finish line. At the end of the day, we were responsible to clean-up the area, which included taking down the posters, collecting any trash that was left around, and organizing the left over supplies, such as the extra water, granola bars, bananas, and medals. Reflecting upon our service learning time and how it relates to the Standard of Ethical Conduct of the PTA, we related this opportunity to Standard 6 stating that “physical therapist assistants shall enhance their competence through the lifelong acquisition and refinement of knowledge, skills, and abilities.” Although we did not necessarily gain any skills or abilities pertaining to physical therapy exclusively, we now have some basic knowledge about tobacco use and lung conditions and have the proper resources to point our future patients in the right direction regarding respiratory health conditions. Standard 1A states that "physical therapist assistants shall act in a respectful manner toward each person regardless of age, gender, race, nationality, religion, ethnicity, social or economic status, sexual orientation, health condition, or disability." Chicago is a big blend of all these things listed and although this standard seems to go without saying, this should be true in every situation, not just in the physical therapy field. During our volunteer time, we helped people who were feeling light headed, nauseous, and out of breath. We helped anyone who needed it without discrimination and with an equal amount of compassion and concern, despite their characteristics and background. As a health professional this is especially important, in that all sorts of people come to us for our professional help, and it is our job to treat them with respect and equality throughout their span of care. Standard 2A states the “physical therapist assistant shall act in the best interests of patient/clients over the interests of the physical therapist assistant.” When volunteering, one gives up their free time, opportunity to be with their friends and family, and sometimes even sleep to help others. Although volunteering can be rewarding, it is also an opportunity to give back to the community and others. Seeing how emotional some of the racers were- some racing for a family member who was lost to lung disease, others who overcame their condition themselves, and those climbing for their own personal gains or goal- made waking up earlier worth it. We have even had racers go as far as to individually thank us for our volunteering at the event. Regardless of whether one is appreciated for their volunteered time or not, having compassion for others around you and putting others before yourself can make the difference between a good clinician and great one. Standard 7A states that “physical therapist assistants shall promote work environments that support ethical and accountable decision-making.” When told to perform a certain task, we did so, allowing the crew captains to focus on other tasks without having to worry about this one having to be done. They could count on us to move to a different location to perform a different task when needed as well, like when they needed more help in the cheering section of the finish line than where we were passing out medals. Lastly, Standard 8A states that "physical therapist assistants shall participate in efforts to meet the health needs of people locally, nationally, or globally." Our team may not have directly helped people meet their health needs, but indirectly we were a part of helping the Respiratory Health Association raise close to one million dollars in donations which will then go towards helping those with lung disease through research and awareness. We were at this event to support an organization that advocates for people with impairments, activity limitations, participation restrictions, and disabilities in order to promote their participation in community and society. They raise funds for education, research, and policy change efforts for various lung diseases, hoping to cut down on the number of people suffering from these lung diseases and improving their ability to participate in various activities, such as this event. During our volunteer experience, we were taken aback by how many participants there really were, and with such varying ages, the youngest participant was 7 years old, while the oldest was 93 years old. It was amazing to see so many people come out and participate in such an amazing event, from multiple states and even a few countries.We were able to learn more about an illustrious organization and event. Participating in this event reinforced our ongoing passion and interest in being involved with these types of organizations and race events. We plan to continue volunteering in this type of setting, hopefully getting a little more involved in the post race treatments, such as stretching and injury assessment. It’s also enjoyable meeting other volunteers and participants that have a similar interest. We were also considering participating in the event as runners next year, just to see another aspect of the race. We learned from this exposure that there are always opportunities for us to volunteer at events or clinics, whether small or large, to give back to my community and to be a helping hand to the public. We have never left volunteering feeling as if it were a waste of time or energy but rather have left feeling positive, encouraged and optimistic about moving forward, personally and as a community. It brings a sense of unity, where strangers come together to better our world and to be there for others. Being college students limits our ability to contribute financially (hopefully for now) but have found that it can also, be helpful to the organization by giving our time, by petitioning, and by bringing awareness to others about their mission of helping those with lung conditions. Every little thing does count. By expanding our own knowledge on these issues and gathering resources, such as the RHA website for future references, not only for ourselves but for others as well, adds more tools that we can utilize for our patients and for our loved ones. If you would like to donate or learn more about the cause and event you can find more information at lungchicago.org.